Using your hands, combine the mince, egg, vegemite, carrot and onion. Season and roll into balls. Heat the oil in a large non-stick frying pan. Cook half the meatballs for 4-5 minutes, turning as needed. Remove and repeat with the remaining meatballs. Return the meatballs to the pan and add the passata. Cover and cook over medium heat for 20 minutes until cooked through. Cook the pasta in a large pan of boiling water, as per packet instructions. For the spiralized zucchini, add to the boiling water 1 minute before the pasta is cooked. Drain and place in a bowl and toss with butter. Spoon the meatballs and sauce over the top and serve with basil leaves and finely grated parmesan. If you are using different types of pasta, make sure you put the pasta with the longest cooking time in the pot first to ensure they are ready at the same time. You can substitute the zucchini for carrot or sweet potato spirals. 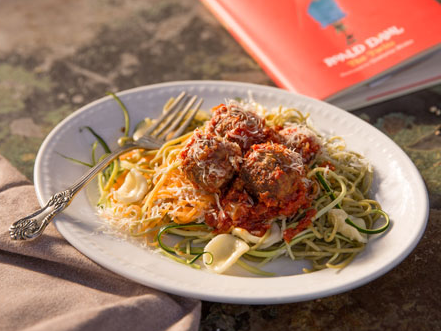 You can cook extra meatballs and pop them in the freezer for a quick lunchtime meal. Celebrate Roald Dahl's birthday with recipes that will transport you to the pages of your favourite childhood books. James and the Giant Peach, the BFG, Matilda and The Twits – these are just a few of the childhood favourites written by the much-loved Roald Dahl. As well as being a brilliant storyteller, Dahl was a huge food lover who created many marvellous recipes, inspiring generations beyond his years with both his literature and his quirky kitchen creations. To celebrate Roald Dahl's birthday on 13th September, Australian Beef has partnered with The Grounds of Alexandria to bring two of his famous recipes to life. Let your imagination run wild as you create fresh beef Mudburgers inspired by James and the Giant Peach (mud optional) and the squiggliest of wormy pasta with meatballs from The Twits. The Grounds of Alexandria head chef, Paul McGrath, says: "Dahl's books are enjoyed by young and old the world over, and reading his magical stories to my children is always a memorable time. I've always been inspired by Dahl's imagination so it was exciting to create these beef recipes that pay homage to his magical stories. They are easy to cook up with the family and also offer a healthy choice with lots of hidden veggies packed in – just don't tell the kids!" Not only are these recipes easy to create at home, but from Monday 10th – 17th September Sydneysiders can head to The Grounds of Alexandria to try out the scrumdiddlyumptious dishes first hand at the urban sanctuary.